Originally from Lexington, Kentucky, Alyssum Pohl brings wit, joy, and soul to her performance. A lifelong dancer, she began her study of tribal-style bellydance with Sri Tarasita, director of Rakadu Gypsy, in 1998, and commenced performing with Rakadu three years later. Rakadu, famous for their storytelling and improvisational bellydance, was the perfect launching pad for Alyssum's performance style. In addition to bellydance, Alyssum is accomplished in yoga, front-bending contortion, rhythm tap, and has many years of training in dance forms from around the world (including creative movement, lyrical stage, jazz, classical Indian, classical Chinese and Mongolian, African, contra-dance, waltz, 80's pop, and pop-and-lock). While she lived in New England (2004-2008), she honed her own style of tribal bellydance by incorporating her contortion abilities and sharpening her isolations. During this time, she also began teaching regularly and coached Boston-based tribal troupe, OmBellyCo. 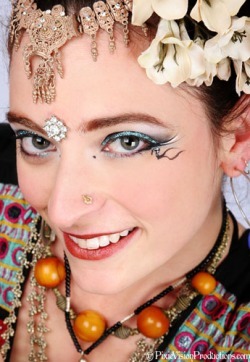 Alyssum has been hailed as "Boston's Mother of Tribal Bellydance." Four years of medical training aided her understanding of anatomy, so she is as technically proficient as she is talented. She is influenced greatly by her teachers Sri Tarasita and Julie Lively as well as Heather Stants, Mira Betz, Olivia Kissel, and more (check out her links page). During her time in California (2010-2012), she studied with several of the Bay Area talent including Mira Betz, Zoe Jakes, Kami Liddle, Jill Parker, and Rose Harden. She also was invited to speak at the 2011 TEDx Monterey event, where she performed/presented her understanding of evolutionary innovation versus revolutionary innovation. Alyssum is now based in the greater Washington DC area, where she can be seen performing with several local productions including Salacious Powderbump, the Circus of Wonders, DC Tribal Cafe, Valentine Candy, and Tilted Torch.